While the economy withers, there is a fast food company that GREW by 23% in the last year. And, crazily, it features raw and sometimes local produce. That photo up there was taken of the lunch that I had to drive 30 minutes to try because, alas, there isn't one of these restaurants near my house. BUT, one sprouted up close enough to visit just 2 months ago, and I just had to try it. Yes, Chipotle has arrived in a place called Chicopee (try saying that fast - "Chipotle Chicopee, Chipotle Chicopee, Chipotle Chicopee"). You know what is kinda crazy about Chipotle? Their profit margins are among the highest in the fast food industry - AND they spend more on their food and more time preparing it. What are the others doing wrong? Is it possible the model of manufacturing food at a central headquarters and then reheating it isn't as profitable as just cooking on site? Here we are needing FRESH food and Chipotle starts actually serving it. You should AVOID the burrito. The calories in just one tortilla is going to set you back 290 calories and that is before you add anything else. The "Bowl" has rice and no tortilla as it's base - and I didn't try it. Three ounces of rice is 130 calories but it looks like they use a lot more than that for the bowl. They give you THREE tacos and the taco shells are 60 calories each (unless you go for the flour tortilla which is 90) so if you like tortillas the tacos are a much better choice than the burrito. Of course, the best option for Snack Girl readers is the SALAD. I put brown rice, black beans, fajita vegetables, grilled chicken, fresh salsa, and a spicy salsa on my Romaine lettuce. I skipped the cheese, sour cream guacamole, and chips. Also, I asked for a light amount of chicken - as 4 ounces seemed like too much to me. Now, we can complain about the sodium in this food. I don't know why but 2 ounces of their red tomatillo salsa which I poured all over my salad instead of their salad dressing was a whopping 510 mg of sodium per serving. oops. Their vinaigrette has 700 mg of sodium, 260 calories, and 24.5 grams of fat per serving - so don't you dare order that! It is best to consult their nutrition facts BEFORE you go to the store - see Chipotle Nutrition Facts. 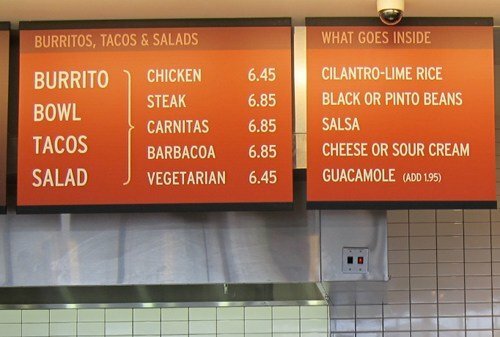 Chipotle should have the nutrition facts posted - but I didn't see them. And, their website should be interactive so us calorie counter types can easily figure out our meal. 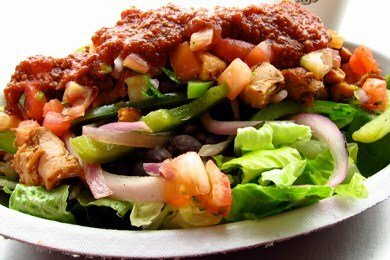 If I went back, I would just have the salad with beans, light amount of chicken, vegetables, and fresh salsa and I would add some Tabasco that they have supplied for us heat lovers. Leaving out the rice saves me 130 calories and leaving out the red tomatillo salsa - 510 mg of sodium. Okay, enough about the numbers. The food here tastes good and fresh. And, they don't shove cookies in your face like Subway for dessert. There was no dessert offered. Hurray! If you are out and about and need some lunch - give it a try. Here is a link to their Location Finder. Have you tried Chipotle? What do you think? Chipotle's would be nearly perfect if they offered whole wheat tortillas (in a much smaller size!). We recently got a Chipotle and I love it! Like every other restaurant you definitely have to watch the portions, but I thrilled with the healthier choices. I am not a fan of change and hate to say it but they were caught for hiring illegal aliens. I live in Denver and have been eating Chipotle for years, regularly going to the original! I love the fact that they're everywhere now. Also, we're gluten free and, aside from the flour tortillas, most everything is gluten free! Look at the website for more information on that, but it's great for those of us with food allergies! They just started serving brown rice,in my area (WI). Hopefully whole wheat tortillas, are soon to come. I like the tortilla so I get a vegetarian burrito and split the burrito in half...saving the second half for a second meal. Works for me! We have several close to work and one about ten minutes from home. I've eaten there once, had the burrito, long before I was even thinking about weight loss, and it wasn't that great, but that may have been due to my choices. Have to try them again. Thanks for the suggestion! Glad to see Chipotle getting such a good rec from Snack Girl! It is the most healthy choice out there. and so fresh. My boyfriend and I get the bowl with NO rice. And it's enough for the two of us to split. That's an awesome deal. I absolutely love them! It really is ridiculously FRESH! The first time I went I got the burrito but it lasted me 3 meals. So now I get the bowl (I've gone like once a week) and it lasts me two meals. It's so good!! And I love looking forward to the tasty leftovers in the fridge! Just be careful if you're thinking this is great for weightloss--look on the website for nutrition information because the ingredients add up quickly! Yes, Chipotle is our go to stop after soccer practice at 7pm! The kids love it and it is an "aware" company doing good things. Have you read a book called "Eat This Not That" Great resource for the family. It also lays out what to order in these types of restaurants if you are looking for a less fat/ calorie alternative. It also says in the book (my family was shocked!) that eating a donut is probably better than a bagel! Well, I digress...but check out this book! Thanks Snack Girl!! I too prefer Moe's but Chipotle will do when I'm someplace where there aren't any Moe's. I can't eat the pinto beans at Chipotle because of the pork but I can at Moe's. I have a chipotle at my local mall that's only 5 min away, so on days i want to treat myself or just have a more enjoyable time (in front of my laptop watching stuff while i eat usually), i head to chipotle. I almost always get the Chicken bowl with everything except the sour cream. a lot of times i get all 3 kinds of salsa too though :x Still not the healthiest for sure (compared to what you got) but it's hugely satisfying when I got the craving! I love Chipotle too, but I also love Moe's adn Willy's two other burrito places all within one square mile of each other that serve exactly the same thing. The choice of brown rice instead of only white rice is a great start. Maybe we could inundate their website with a request for smaller whole wheat tortillas as an option. My nearest Chipotle is 36 miles away, sadly, but it's near my Costco and Trader Joe's, where I trek every three months. I'll stop by next time. Thanks for doing all the work for us - you help to make staying on WW so much easier this time around and will help me to eat wiser to keep it off.